Fruitcakes do not have the best reputation. A good number of us have had to battle through a slice of post Christmas dinner fruitcakes, wondering how we would survive not because of overindulgence but because it was just plain and simply bad. But we have battled through it because it has been a tradition. There isn´t any wonder about the origins of some of these gems! 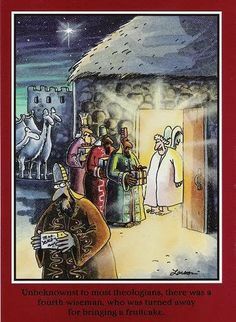 The above caption reads: Unbeknownst to most theologians, there was a fourth wiseman, who was turned away for bringing fruitcake. 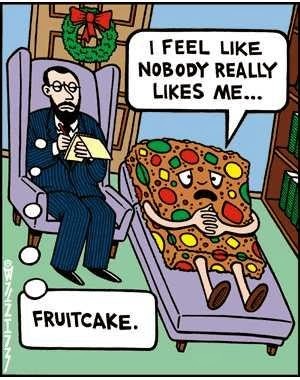 Fruitcake was never a tradition in my house but a few years ago my mom told me that her mother made them and that they were delicious. I was quite surprised by this. I found myself wondering, ¨Is the reputation of the dreaded fruitcake a myth? If my grandmother made them and they were reportedly unforgettable, surely I must be missing something? 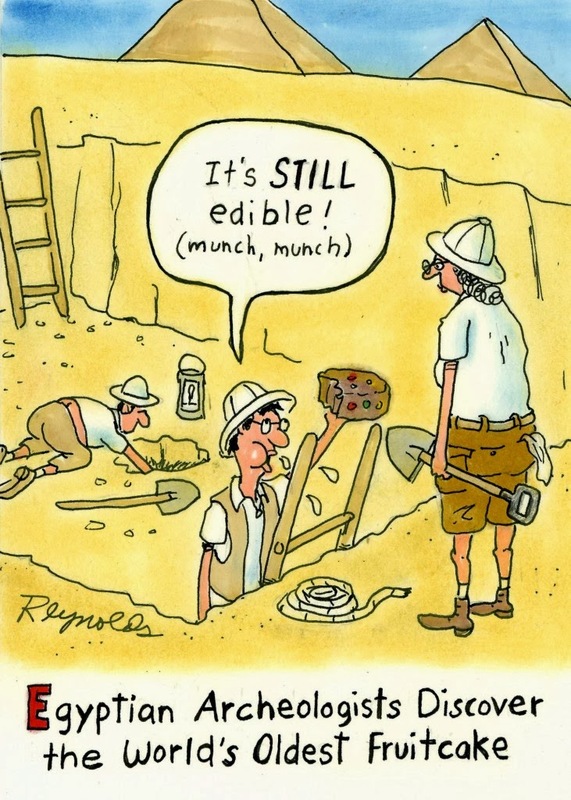 !” So I got digging and discovered Delia Smith. Now, Delia´s ¨Complete Cookery Coursebook¨ is a classic. The most popular recipe in her cook book is her fruitcake, also known as a Christmas cake. She herself has admitted that when she was promoting her cookbook, she would bring samples of her Christmas cake and people would leave not only with a happy tummy but with a copy of her cookbook! I decided that I had to try it! I invited my parents to spend Christmas with me and would make them a fruitcake! I was living on my own in Malaga and felt proud to be able to invite them and to make them a Christmas dinner! The result was wonderful. Was it perfect? Well, no! I went a bit overboard with the brandy hahaha! Still, it was a memorable moment when I brought it out after we had our Christmas turkey. No crappy dry cake! It was rich and moist. My mom said that my grandmother would have been proud of me. Since then, I have made a fruitcake every year and manage to learn new things every time.The key to making these is time and following some good tips. They do not require a lot of culinary expertise either! To be honest, they do not take a long to prepare. Quite simple, really. But when you give them their brandy bath (a little brandy goes a long way..not talking about marinating here! ), the flavour improves with time. You bake the cake, put in about two or three teaspoons of brandy, wrap it, then store it in a cool, dry place. Then a week or two later, you do the same, perhaps just one teaspoon this time. Yes, it is worth the effort. The finished product is so impressive and my husband, who does not enjoy a glass of brandy like I do, loves it. When I got married, he told me he had never tried a fruitcake in his life. Now when he knows I am going to make it, it becomes an event and he is so happy! 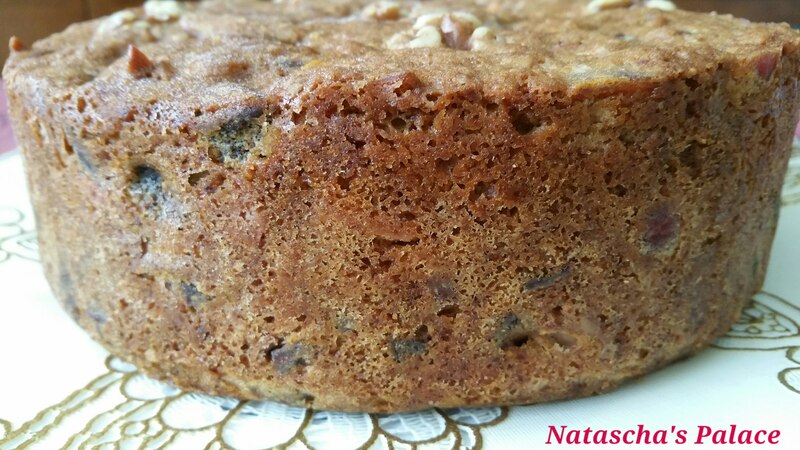 In fact, I made my fruitcake today and he said that he wished he could have a slice right then and ther because it smelled so good! I am posting this recipe now because maybe you will want to try this. 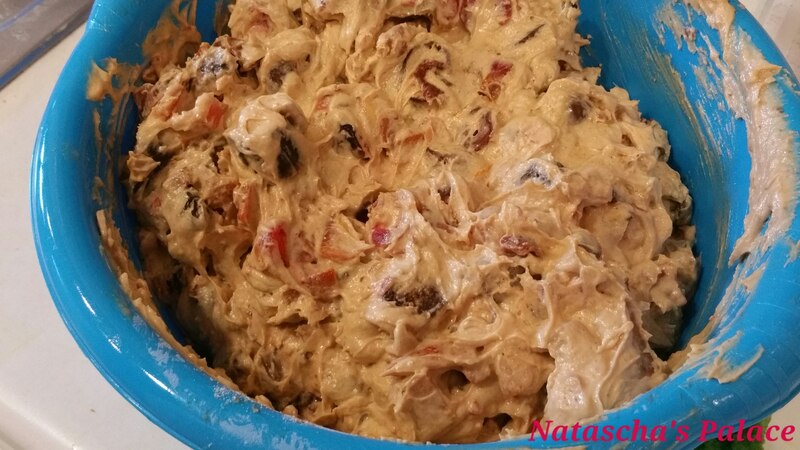 Maybe you will have some happy memories of having fruitcake with your family as well. You can make this in September, October or November. The earlier you make it, the better it is but make it at least four weeks before you are ready to serve it. It really is worth a try! If you decide to take up my challenge, here are some guidelines: (I have Lili over at Lili’s Cakes for inspiring me to post a challenge. I love her challenges). 1. On the 26th of December, I will post the Fruitcake Challenge link. I will post the results of my own fruitcake too! 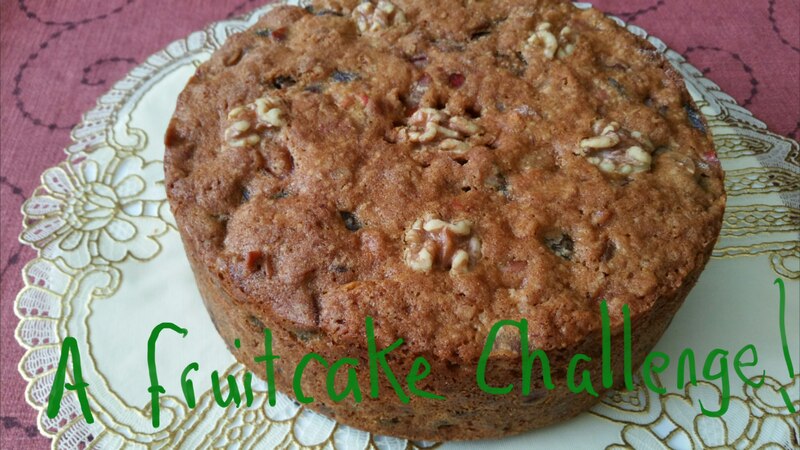 Link your fruitcake posts to my post so that I can include you in the challenge. As soon as I have all the links, I will share all of your results in a later post on my blog. The deadline to post them is January 2nd. 2. You are not obligated to share your recipes or any adjustments you made. Still, if you have any advice to share, it is much appreciated. 3. It would be great if you could include this image in your post. 4. If you have any doubts or questions, please ask. * You don´t need to use any kind of expensive brandy. I use a Spanish one that costs about 6 euros. If you are not keen on brandy, you can choose a dark rum or even whiskey instead. I have also heard that if you don´t want to use alcohol, you can also use orange juice. * Before you make the cake, soak your dried fruit and nuts in your brandy and rum for 1 to 2 days. It improves their flavour tremendously. I just put them in a tupperware, fill it with brandy until they are just covered, put the lid on it and then set it aside. After one or two days, drain them well before baking. Afterwards, the leftover brandy can be used to ¨feed¨ your cake. No waste. * I use a cake pan that is 3 inches deep and 9 inches wide. I love the height it produces. It is a springform. I recommend using a springform because it improves the shape and it is easier to remove the cake afterwards! * This cake can also include a marzipan icing but I never use it. I think the cake is perfect as it is. If you choose to do the marzipan icing, do it on the day you will serve it. The Christmas cake marzipan icing can be found on Delia’s website. Here is the original list of ingredients from Delia online I have adapted her instructions only slightly. For example, she only soaks the dried fruit and not the nuts. She covers her cake with parchment paper and I don´t. You decide what you want to do! A day or two before baking,weigh your dried fruits and nuts that you are using. Place them in a bowl or container, cover them in brandy or rum, cover and set aside. Drain them well before baking. Set aside the brandy. You can use it to feed your cake afterwards. Butter your cake pan and line it well with parchment paper. It is worth the effort to cut the pieces well to fit your cake pan because it improves the shape of your fruitcake. Appearance is important! In a large bowl, sift the flour, salt and spices. Set aside. Then in a separate large bowl, beat (on a low setting) the butter and sugar until pale, light and fluffy. In another separate bowl, beat (once again on low setting)the eggs until they are fluffy. Then add them to the butter mixture a little at a time. It is important to add them gradually so that the mixture does not curdle. Now fold in the flour gradually. It is important that you fold it in to keep the air in. Set aside. Now take your drained fruit and add about 3/4 cup of flour. Mix it in until the fruit is well coated. This is done in order to prevent the fruit from sinking to the bottom of the cake when you put it in the cake pan. Now gradually add in the fruit and nuts.Then the grated lemon and orange zests. 6. Place the cake on the lowest shelf in the oven. When you see it turning brown at the top, cover it with foil. Delia says to cover it immediately with parchment paper with a hole in the middle the size of about a quarter. Whatever you decide to do, just make sure the parchment paper or foil does not tough the mixture, just the rim of the baking pan. 7. Bake until a toothpick comes out clean. Like i said, the original instructions mentioned four hours of baking time but after two hours, mine was ready. Just remember that fruticakes do take time to bake but ovens vary. The cake center should be springy to the touch. 8. Let the cake cool in the pan for 30 minutes and then remove it to a rack to cool down. 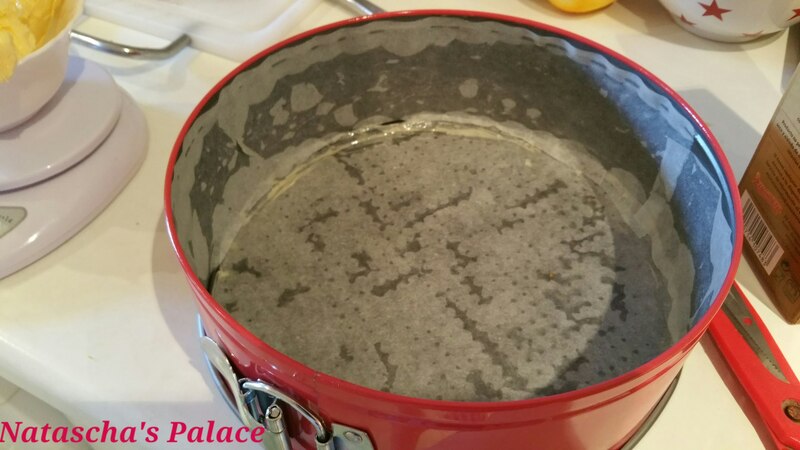 Cool the cake for 30 minutes in the tin, then remove it to a wire rack to finish cooling. Doesn´t it look beautiful? And really, not much work involved! When it’s cold, begin feeding it by making small holes in the top and bottom with a cocktail stick or toothpick. Then pour in 2 to 3 teaspoons of brandy. Wrap it in parchment paper then in foil. (you can also wrap it in cheesecloth or a white tea towel before wrapping it in foil). Store in an airtight container and put it in a cool, dry place. Now you can feed it at intervals. I usually put in about a teaspoon or two every two weeks.As I have said, you decide what you want to do! Just remeber that a little alcohol goes a long way! This goes so well with a coffee or tea. Nothing like a cozy blankee, a tea and a slice of cake. Bring on the cold weather please! I hope you enjoy this and happy baking! I will post the photo of how it looks when it is served at Christmas! I hope you will do the same if you try this challenge! Looking forward to seeing your goodies! I accept your challenge! I’ve never made one, I can’t wait to try! Hurrray! That is great news! Thank you! I have Delia’s Christmas cook book and have used the recipe with some slight changes, I usually ‘feed’ the cake with Irish whiskey and its delicious! The recipe and of course the cake look delicious. I am going to try it! 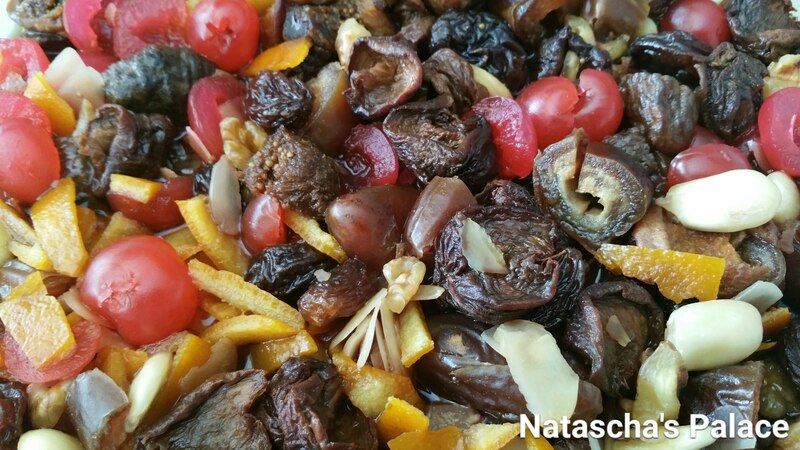 A fruitcake challenge sounds great Natascha! 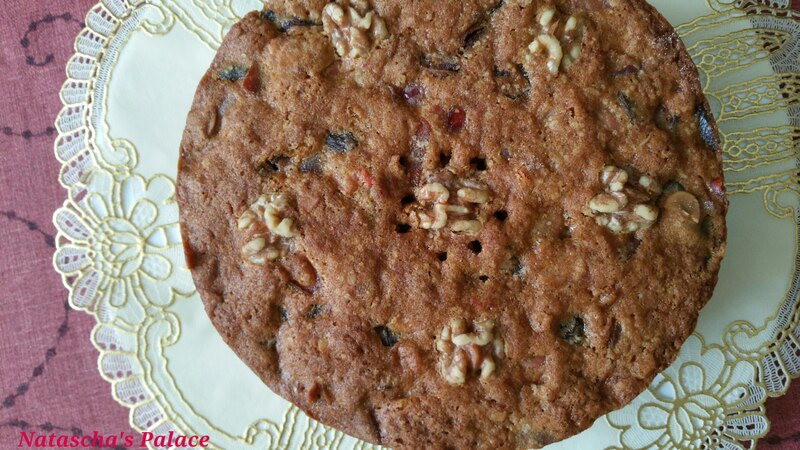 Love fruitcakes and making them. 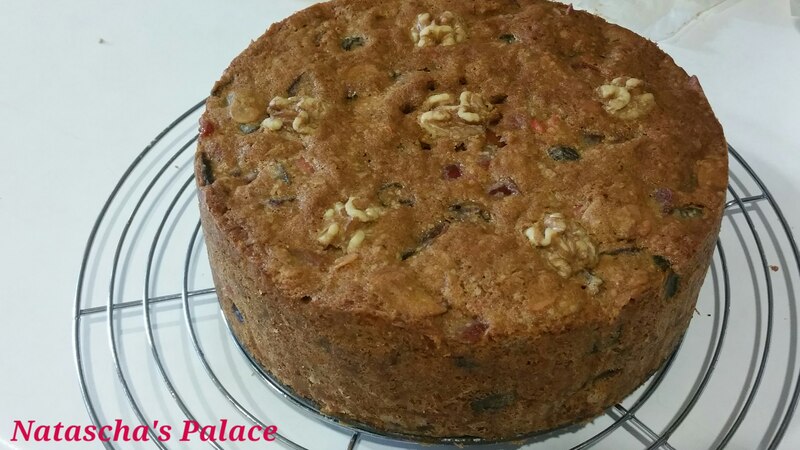 I was planning to post a fruitcake recipe around October since people would make one a month or two before Christmas – would it be okay to post that recipe up on your challenge? Or maybe I can invent a new one in December … ? Anyway, looking forward to seeing everyone’s fruitcake here… yay! And thanks for the shoutout. Thanks for the adapted recipe! I shall book mark this in my recipes. I’m not a huge fan of fruit cake, but if it’s a very delicious moist one with high quality fruit I’m all for it. 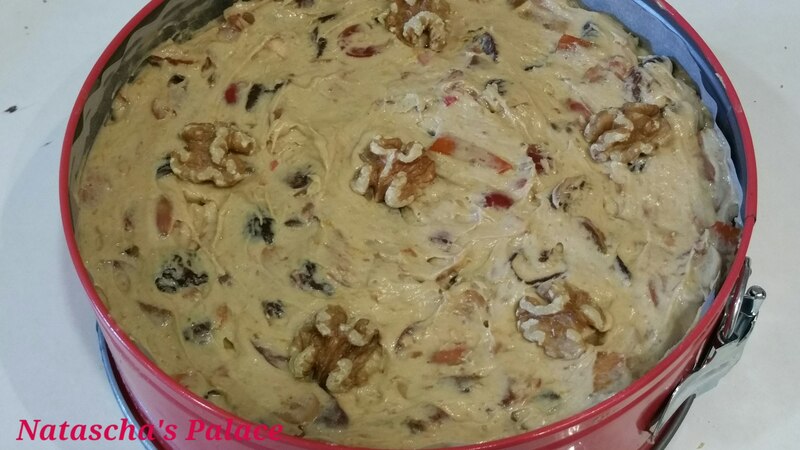 I can still remember my lovely Mum’s fruit cake when I was a child, I seemed to like it a lot more then. Interesting for me to find a Delia recipe on your blog, I’ve always loved Delia’s recipes, gre up watching her cook on tv. I bought her complete cookery course many years ago, still use it today! I have sometimes found her oven temperatures to be a little inaccurate, not found that with any other recipes, definitely not my oven! But I still love her basic recipes, they are so good. I actually live a ten minute walk from her restaurant and football club she owns in Norwich, Norfolk, England. I’ve eaten in the restaurant, very lovely, but never yet met the lady herself. I might do one day, Norwich is a small city. Hope you don’t mind me mentioning this, but your link to Delia Online is (DeliasCleaners) a dry cleaner company in Arizona. Kind of interesting, but not quite what I was expecting! I think you might have meant to link to this http://www.deliaonline.com/ Not sure where that recipe is though!